ARTIST STATEMENT I synthesize the possibilities across ecology, geology, and science in general. I travel the world to conduct research connecting geological identities, man’s drive for scientific exploration, and humanities connection to The Universe. Where are we going and how will we get there? Conscious and subconscious connections are visualized and expressed through art as a conduit to the interconnected cosmos. ARTIST BIOGRAPHY Sri Prabha is a mixed media artist originally from Hyderabad, India. His artistic training includes the Cornish College of the Arts which was later augmented with a Masters in Clinical Psychology. His research across ecology, geology, and science manifests across a range of mediums that include installations, video, sculptural paintings, and photo based works. Additionally, he integrates into his aesthetic process tenants of geography, nature, time, human origins, and the cosmos. Prabha illuminates new possibilities and reconciles the old and new by synthesizing deeper understandings of our relationship to the natural world. He asks how our intellectual understandings compare with our emotional responses to these discoveries. Sri just won the 2016 South Florida Cultural Consortium Fellowship, was named “Best Visual Artist 2015” and included in “10 Visual Artists You Need to Know”(2016) by Broward Palm Beach New Times. Recent shows include the historic south Florida survey show 100+Degrees in the Shade, an expansive solo installation at Young at Art Museum, and an immersive space outpost install at The Art and Culture Center of Hollywood. Other exhibits include The Deering Estate, Boca Raton Museum of Art, pop up installations at the Dupont Building, the Ingraham Building, downtown Hollywood, and public art video installations in the streets of Fort Lauderdale. Sri’s awards include inclusion in The Photo Review Competition Issue (2015), Broward Artists grant, Brush Creek Arts Foundation, and National Socio-Environmental Synthesis Center artists’ residency. He received the Innovative Artist Award at Fraker Scott Gallery, and the Juror’s Award from Smithsonian Affiliate, Annmarie Sculpture and Arts Center. His videos were shown in Resfest, garnered the Ford Motion in Drive video award, and his title design work was shown on PBS. He teaches photography and mixed media at NSU Museum of Art, and taught at Film Arts Foundation and Expression Center for New Media in San Francisco. His works are in several private collections in Chicago, Seattle, San Francisco, Miami, New York, Washington, DC, and Copenhagen. 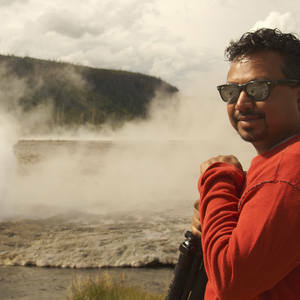 Sri has lived in numerous places like India, Germany, Denmark, Seattle, San Francisco, and Boston, and now lives in Hollywood, Florida with his Danish wife. The main areas of investigation in the home zone are estuaries, water, and birds. When not home, he spends a considerable amount of time engaging in research across the world looking for the nature of existence with the aid of new technologies. Combining his love of travel, exploration, and science, Sri is constantly pursuing new ways of looking at the world. 2005 M.A. Clinical Psychology, Argosy University, San Francisco, CA. Outpost, Art and Culture Center of Hollywood, Hollywood, FL. Fresh, Sol Gallery, Miami Beach, Fl. WET, Cando Arts Co-op Gallery, Miami Beach, Fl. Curated by Diane Camber.